Oil or water flavored emulsion is the most common form of flavor delivery system followed in the beverage industry. Among the various beverage segments, still or carbonated beverages consume most of the oil or water flavor emulsions. The emulsions are produced by emulsification of the flavor oil or triglycerides with protein-anionic polysaccharide complex polymers to produce stable liquid concentrates and beverages. With the rise in demand for innovative and novel beverage products, formulators are looking for stabilization of colors, flavors, texture and micronutrients in beverages as these ingredients are not soluble in water. There has been a steady rise in demand for multifunctional beverage emulsions given their inherent features such as protection, controlled release, targeted delivery and taste masking. This demand can be witnessed across the globe and more specifically in North America as the region tries to gear up to meet competition in the global market. The growing awareness among consumers regarding organic certified health products has increased the consumption of natural ingredients. This in turn is driving demand for organic ingredients. Most of the demand for organic ingredients comes from food supplements manufacturers for probiotic beverages. Rise in demand for chemical free ingredients is boosting demand for organic beverage ingredients in Europe including beverage emulsions. According to Leatherhead Food International, Europe accounts for the largest segment of the natural colors market, ~36% of the total global market. Beverage manufacturers are looking for natural alternatives that are just as effective in producing crystal clear, stable drinks with no oil residue, which calls for natural color beverage emulsions. As a result, a higher demand for natural color emulsions will augment growth of beverage emulsions in Europe. In Europe, emulsions are employed in beverages mainly in dairy based drinks such as chocolate milk, flavored milk, and recombined milk. Emulsions are known to bring stability, particle suspension and mouth feel. In addition to this, emulsions further provide stability for long life milk (UHT treated) by preventing separation. Greater benefits of emulsions in dairy beverages in Europe lays a strong growth potential over the forecast period. Moreover, the increase in obesity and increased consumer awareness is driving higher demand for low fat foods. Availability of low-fat beverages produced with the help of emulsions is boosting market demand for beverage emulsions. 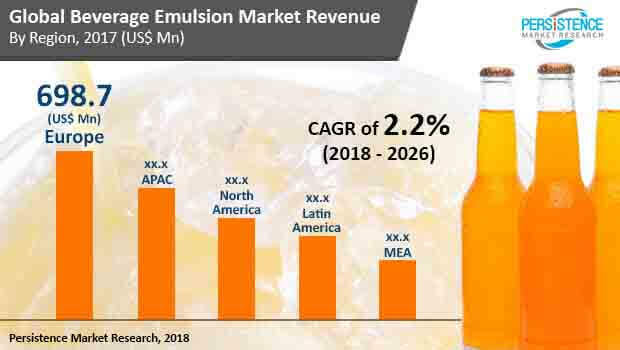 Revenue potential from the Asia Pacific food emulsions market is most lucrative and governments in countries in the region are approving the use of emulsions as a flavor enhancer. Asia Pacific is projected to hold a major share in beverages consumption by 2028. Key growing markets including China, India, Thailand, Australia, Singapore, Malaysia, and Vietnam will add up to the region’s growth in the beverages industry. Economic conditions in the Asia Pacific will further boost consumption of innovative beverages resulting in demand for innovative beverage ingredients including beverage emulsions. Moreover, the wide availability of agricultural raw material supplies such as palm oil and other oilseeds and corn and other grains in Indonesia, Malaysia, India and Thailand are expected to lead to a strong growth potential to explore various feedstock for beverage emulsions production. Palm oil esters and corn starch are predominantly used for emulsions production. Adoption of other grains and oilseeds as feedstock will further enhance the supply of beverage emulsions in the APAC region. Arthur Branwell & Co. Ltd.